Home News Jamie Oliver reveals the secret to the PERFECT roast potatoes (and you will need a masher and a spray bottle). Jamie Oliver reveals the secret to the PERFECT roast potatoes (and you will need a masher and a spray bottle). It's not Christmas without roast potatoes, but it can be tricky to get your spuds perfectly golden and crisp on the outside, and soft in the middle. Now TV chef Jamie Oliver has revealed his hack for the perfect roasties just in time for the big day. 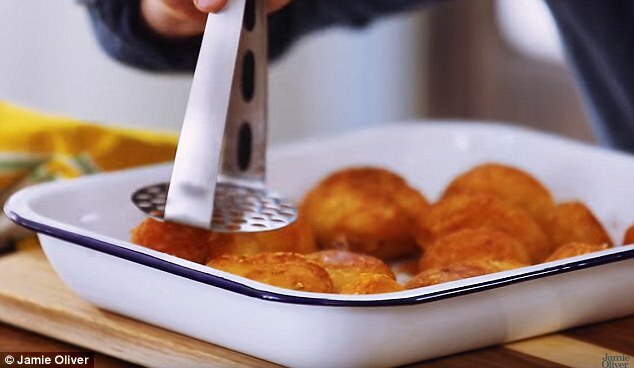 In a video for his Youtube channel, the 42-year-old father-of-five says he uses a flat utensil, such as a potato masher, to squash his roast potatoes once they are cooked. 1. Par boil the potatoes. 2. Toss them in a little butter and olive oil. 3. Roast until golden and crispy. 4. Lightly squash with a flat utensil, such as a potato masher. 5. Top with sage leaves and roast for another 10 minutes. 6. Spritz with a little vinegar as they come out of the oven. 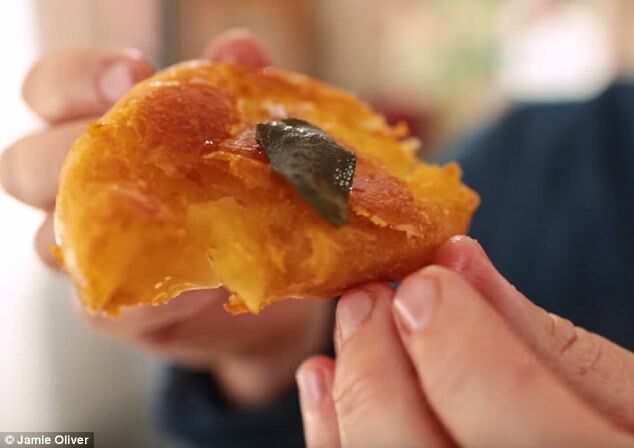 The restaurateur, who is married to Jools, says the trick means there is a larger surface area which makes the potatoes even crispier on the outside, and fluffier in the middle. 'Once you've done this you will never ever ever look back,' he promises in the video, which contains his best tips and hacks for cooking Christmas dinner. Jamie tells his viewers, who have watched the video nearly 60,000 times since it was posted on Sunday, that you need to parboil the potatoes before tossing them in 'a little butter and olive oil'. You then roast the potatoes until golden - and that's where the masher comes in. Once they have had their time, Jamie lightly squashes the potatoes using a flat implement, before topping the spuds with sage leaves. He then roasts the potatoes for another 10 minutes in the oven. 'These herbs will become delicious,' Jamie claims. For the final touch, the chef has another trick up his sleeve. He recommends cooks buy a spray bottle from the chemist and fill it with vinegar. Then, as you pull the potatoes out of the oven, you should spray vinegar over the top of them. 'It immediately evaporates and puts a kind of tang on your roast potatoes like you can't believe,' Jamie says.